If you’re up to speed on HBO’s Game of Thrones, at least a few episodes into Season Three, then this post won’t be spoilery. I want to state up front that I’m not siding with the Warlocks of Qarth against plucky Daenerys Targaryen. I can’t defend their nefarious plot to abduct her in order to draw power from the Silver Queen and her dragons. Instead, I’m defending them against allegations that they are an over-powered drama-breaking element in the show. When Game of Thrones first aired, there was a fair amount of discussion concerning the genre of the show. Was it a fantasy or just an alternate medieval period piece? The lack of overt magic pleased those fans who were not that into fantasy but engrossed by the quasi-historical dynamic. Then dragons appeared at the end of the season, changing the equation. As the second season began, viewers were introduced to the witchy Melisandre who dramatically and undeniably wielded supernatural powers when she birthed the bouncing baby death-monster that slew Renly Baratheon. The introduction of inexplicable game-changing magic raised doubts in some minds that the show could remain a compelling drama, if magic could easily be added in to any situation, making the stakes hard to comprehend. 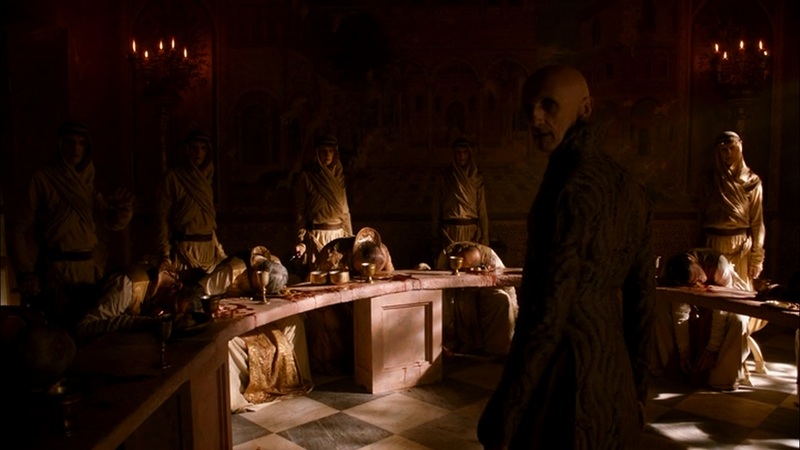 Then the Warlocks of Qarth were introduced, displaying miraculous abilities that made them appear invincibly powerful. Is that too much magic? If the Warlocks can create stab-immune teleporting duplicates of themselves, how could they possibly be defeated? Because the Warlocks can’t create stab-immune teleporting duplicates of themselves! There’s no need to believe that they’re all powerful. They’re relying on showmanship and probably no more than a wee bit of magic. Pyat Pree: Behold Khaleesi! Just like a gem has many facets, there’s a dude who looks exactly like me back there! MAGIC! 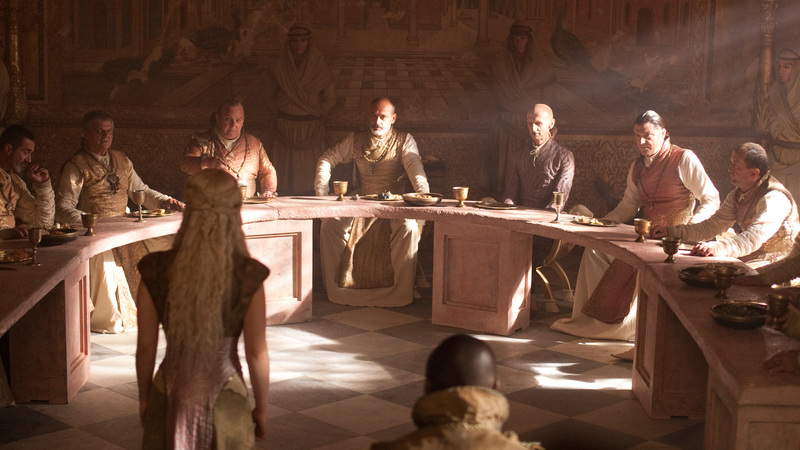 Daenerys: Oh, that other ugly bald guy just far back enough to possibly look close enough to you to be your brother? Pyat Pree: Spooooky! I have no twin! Wooooooooooo! Daenerys: You’ll have to forgive me, but all you Qarth people look alike to me. Pyat Pree: Now that you’ve been thrilled by our inexplicable powers, you must come see our amazing talent show at the House of the Undying! Soon after, Dany’s dragons are stolen. Xaro summons the rest of the Thirteen to get to the bottom of matters. Chilling out at Xaro’s includes the usual… dinner, wine, dudes hanging around keeping the wine flowing. Dinnertime at Xaro’s. Ignore those Servant Guys Along the Wall. During the light dinner conversation of “Where Are My Dragons?” Pyat Pree speaks. Pyat Pree: Ease up, I’ve got them back at my place. Xaro: It’s true. I totally traded your dragons for the Comfy Not That Much Iron Throne! The Thirteen: Ouch! Our throats are being cut by the random serving dudes! Possibly our bodyguards. We weren’t paying attention. Pyat Pree: Nonsense! Observe how at least some of them look just like me. You’ve never seen that trick before! Daenerys: Really? I mean, all you Qartheen look alike to me. 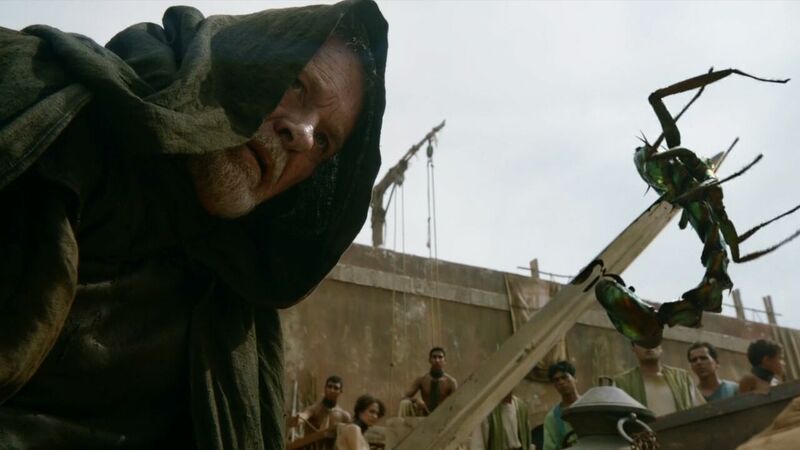 Jorah stabs the Warlock, but doesn’t seem to do any damage. Pyat Pree: It’s Laaaaaadies Night at the House of the Undying! No cover charge! Suddenly Jorah is holding some rags, no warlock. Pyat Pree (or something looking like Pyat Pree) is behind them. Pyat Pree: NO COVER CHAAAAARGGE! Spooooooooooookyyyyyyyyy! Okay, I hope I can be forgiven for some of the dialog. It’s how I remember it. Clearly there’s something mystical, or at least complicated going on. Pyat Pree managed to assassinate eleven members of the thirteen at Xaro’s place. On the surface, it appears that they were killed by warlocks who looked exactly like Pyat Pree. So, since they looked like Pyat Pree, they MUST ACTUALLY be Pyat Pree, right? That’s Right! There Can be No Other Explanation! Maybe Pyat Pree possesses the mysterious powers of the mutant Madrox from the Marvel comics. Maybe the warlocks just happen to look alike. Maybe the warlocks can look like other people. In the picture above where the Thirteen are all having dinner, the serving guys (possibly bodyguards) aren’t creepy duplicates. So either they are dudes that can look like Pyat Pree, or the Warlocks have the ability to look like other people (including Pyat Pree.) It’s not like this show hasn’t shown us someone with the ability to change his appearance. So I’m skeptical on the Madrox theory. Let’s pretend it’s true though. There might have been eleven guys pouring wine that totally weren’t disguised warlocks. Who inexplicably wandered out during the second and third course of servings at Xaro’s council meeting annex/bistro. Since they certainly weren’t visibly standing around as Multiple Man killed the members of the Thirteen. 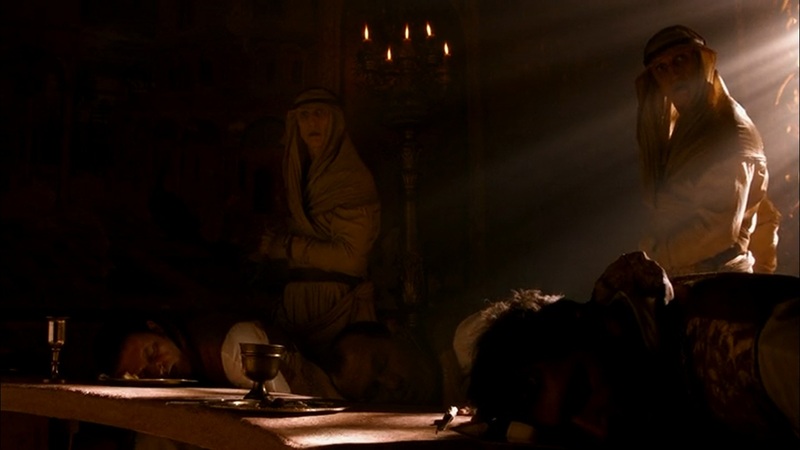 While we’re throwing out odd theories, maybe the Thirteen only pretended to die, as part of the cutting edge murder mystery dinner performance art scene in Qarth. There’s as much evidence for that as Multiple Man. Hey, what about the stabbing and the teleporting? If the Warlocks are invulnerable to harm and can teleport, aren’t they overpoweringly awesome? Thus ruining the later scene with Dany when she sets Pyat Pree on fire? If we don’t know the rules to their teleportation and damage immunity then it makes no sense, there’s no comprehensible stakes! My position: as far as I’m concerned, I know all the rules. They aren’t immune to stabbing or whatever. What? But that’s totally what happened! I’m skeptical of that interpretation. 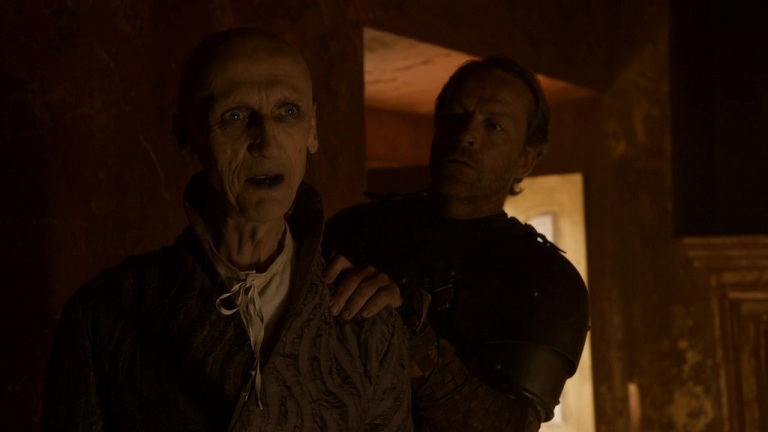 Jorah grabs Pyat Pree, stabs him, and is left holding some rags. Suddenly Pyat Pree is nearby (still wearing his clothes.) The only thing I’m truly sure of is that Jorah was holding some rags. Mysterio does that crap to Spiderman All the Time. I’ll agree that the Warlocks must have power, but nothing that’s shown is that much more impressive than Lamont Cranston-esque “mysterious power to cloud men’s minds” from The Shadow pulp adventures of the 30s. We know that when Dany later goes to the House of the Undying, she encounters vivid and realistic illusions. She’s magically chained with her draconian children when she rejects the visions, and ultimately the chains are shown to be equally ephemeral, they vanish like smoke when Pyat Pree is, err, also smoking. Pyat Pree stated quite clearly that the dragons are a source of magical power for them, and for the dragons to thrive and provide more power, they need their mother. This doesn’t seem inconsistent or unusual to me. 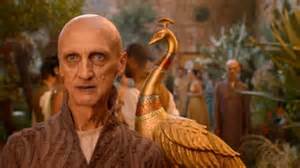 With the dragons located at the House of the Undying, I’m willing to accept that they could produce convincing illusions. It doesn’t seem that groundbreaking or overpowering. 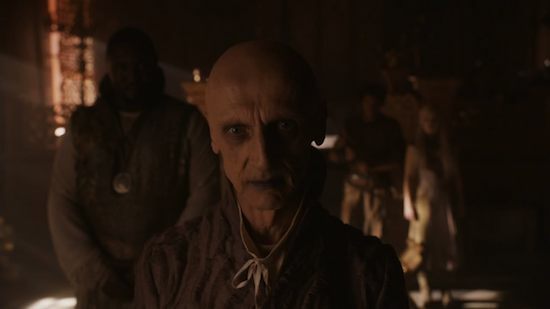 Why didn’t the Warlocks just kidnap Dany with the dragons and force her to come to the House of the Undying? I can’t prove this, but it seems to me Dany coming willingly to the House of the Undying, when she’s already been given a demonstration of the Warlocks power would make their seductive illusions more real. Because illusions are fragile. At Xaro’s, everything is very staged and theatrical, from Pyat Pree’s “look at me, nothing up my sleeve” presentation before the killings, to the series of “Boo! I’m behind you” cheap scares. That has the hallmark of a carnie magic show and not the proof of Dark Lord Sauron level powers or whatever. Because in my opinion, it’s intended to appear scary and impressive. Before the warlocks get their hands on the dragons, they didn’t seem to have any power. After they had the dragons, they had enough juice to put up a magical facade while otherwise performing a mundane execution of Xaro’s political rivals. They are putting on a show for Daenerys, but once the dragons set Pyat Pree on fire (which apparently harmed him and from which he did not teleport, which supports my position) the warlocks ceased to demonstrate any magical powers. Really? There was magic at Astapor? I must have missed that. Okay, we’ll run this down too. Dany and Jorah are strolling back from checking out Unsullied. 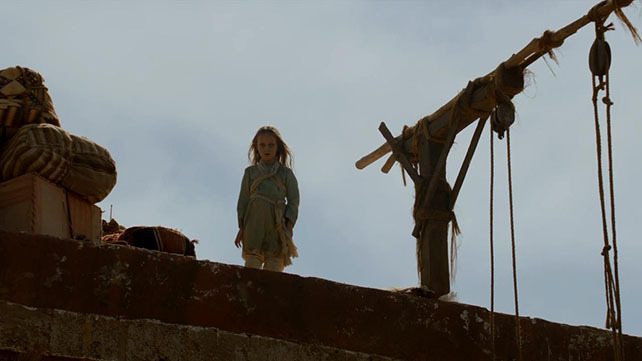 Along the docks, Dany sees a playful little girl who rolls a ball towards her. 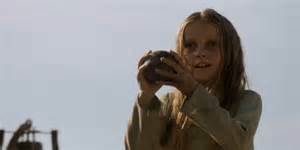 Charmed, Dany picks up the ball and opens it but it’s knocked from her hand by a robed figure. Keep An Eye on That Wooden Crane Up On That Wall. The ball contained a scorpion known as a manticore. The old robed guy kills it. The little girl, now shown with a conspicuously gross mouth like the Warlocks, runs and hops off the pier. There’s no splash. Dany’s rescuer looks: there are neither ripples nor girl. Yoo Hoo! Look at Me! I’m Spooky! Spooooooky! Magic! Suddenly, she’s up on the nearby wall. Oh My God! She teleported!!!!!! So, we’re back to teleporting warlocks again, right? Wrong. The more likely scenario is this: there are two girls. One is under the pier, one is up on the wall. The second one’s appearance was to make sure no one actually, I don’t know, looked under the pier where Penn and Teller were hiding with the little girl. And the net they caught her with. It’s The Prestige, Essos Style. There’s no magic there. Sure, I can’t prove it. One can believe in teleporting magic if one wants, but I’ll believe in a well-constructed con first. The Warlocks were described as illusionists early on by Xaro and named charlatans by the Spice King. Some podcasters I listen to believe the Warlocks are crazy overpowered and make the show internally inconsistent with all this crazy magic. Well done, Warlocks. Well done. You’ve fooled so many into thinking you have no real power when you did have some, and others into thinking that you had Legendary Overwhelming Power when you clearly didn’t. I appreciate you saying that. The part where Jorah ends up holding rags is so reminiscent of something from a Sonny Chiba movie. Not overpowered? Lies. Ninjas are completely overpowered. THESE ninjas aren’t, because they’re old and fragile, but there are those OTHER ninjas Jaqen H’gar is with. THOSE guys are game changers. And possibly magical, but only slightly. The face changing is a little too fast and high quality to be one hundred percent mundane. 1 – The Red Priests/Priestesses: they are shadowbinder and expert in fire and blood, of light and life. 2 – Green magic: The old powers of the North and Old gods such as the greensight, skinchanging and warging. 3 – Sorcerers: Generic magic users such as wood witches, sorcerers, shadowbinders and those in the shadowlands (such as aeromancers) who practise eclectic forms of magic. essentially whatever they can pick up. Though of course the titles sugguest the types of magic i.e. shadowbinders can manipulate and know how to birth shadow creatures etc. Necromancers can summon, control, ward and banish the dead/undead. 4 – Warlocks: Judging by what we have seen warlocks specialise more in mind magic,illusions and necromancy and spirit magic. They may have access to other forms of sorcery. 5 – Valyrian Wizards: Ancient wizards from Valyria who knew and could command great magical power, though its possibly the reason for its doom. The Basilisk Islands is where they practiced blood magic to crossbreed creatures. Their magic is based on fire and blood. 6 Water Wizardry: In Rhoynar they practiced a different kind of magic. they could command the waters so possible rivals to Valyrian magic. Though this is spoken of as legend its rare in ‘Song of Ice and Fire’ that something is mentioned of this nature without having some basis in reality. This is a fantasy show, magic is not science but a mysterious and primal force. N.B. 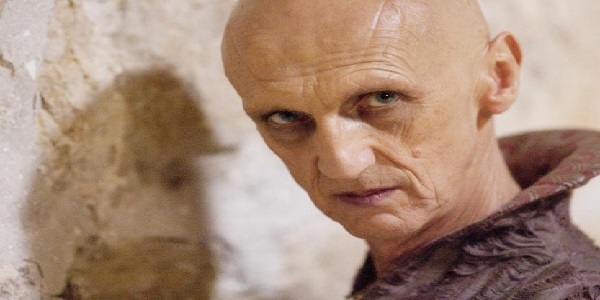 It seems the lack of dragons and the wall in the North being made of magic as well as stone has effected the flow of magical power in Westeros. So with the change of behaviour of the white walkers and the birth of dragons, the primordial shadows of magic are coming back. We are told that ghost grass is growing and dragon glass candles are now burning and more may be coming with it. I think the magic of the warlocks at this stage has become real and they are still refining their skills and they work in ways we can quite perceive because the magic they do plays with perception and reality. Magic and how it interacts in the background of things is always cool to me. Since the Wall is impossibly big and stable, it implies that there is magic at work keeping it up and intact. I wonder if the creation of the Wall reduced a certain amount of magic available in the world, kind of like there used to be 100% magic available, and it takes 25% of available magic to maintain the Wall in a big, long lasting spell. I’m just thinking this, since the Wall is an impediment to the Others who want to come south, and if the Wall was destroyed, there might be an increase in available magic to resist them in various ways. I’m totally talking off the cuff.